Then run it from the mintMenu->Internet menu. The Spanish forums are getting bigger. In fact they’re the largest non-English forums on Linux Mint, both in terms of topics and in terms of posts. As verdegal pointed out, they needed a moderator and he was quick to recommend Maty1206. Is it going to be the Linux Mint Blog? Clement Lefebvre’s Blog? The Linux Mint Dev Team Blog? 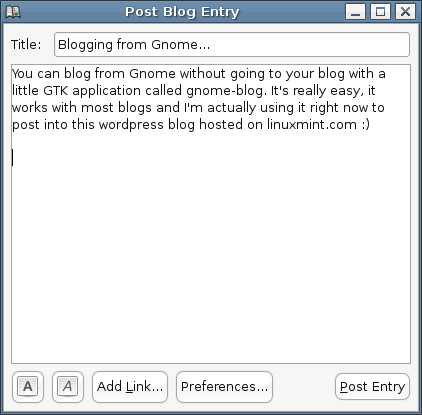 or even The Linux Mint Community Blog? It all depends on who’s joining in and how many people will get involved in this. I personally wanted to improve communication between me and the users. I’ll be posting here regularly. When I had news I usually used the forums and the newsletter. I will still do that as well, but I’ll also post here on this blog. A lot of things happen on the forums. Newsletters tend to summarize important events on a weekly basis… this blog will inform people on what is happening now in Linux Mint. If other people want to join in and participate to this blog I will be more than happy to create an account for them and register them as authors. The more content the better.